English Summary/英文概要： The empires of ancient Persia remain as mysterious today as they were to contemporary Western scholars. Although Alexander the Great’s conquest of Persia is legendary, the military successes of the Achaemenid, Parthian, and Sassanian empires, along with their revolutionary military technology, tactics, and culture have been almost forgotten in the sands of the East. Containing information never before published in English, Shadows in the Desert offers a comprehensive history of Persia’s wars with East and West which spanned over a millennium, and offers an insight into the exchange of ideas and culture that occurred during these clashes between East and West, not only military technology, but influences in the arts, medicine, religion and science. 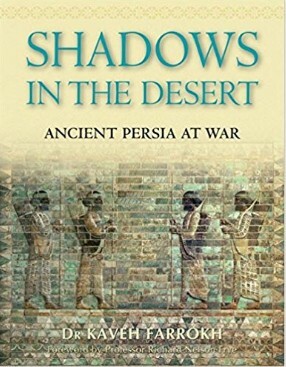 This beautifully illustrated book delves into the rich heritage of the Persians, which was spread around the world through war and conquest, and which, after the fall of the Sassanians, continued to impact upon civilizations around the world. About the Author/作者介绍： Dr Kaveh Farrokh has been researching the military history and technology of Persia for two decades. He obtained his PhD in 2001 from the University of British Columbia, where he specialized on the acquisition of Persian languages. He has given lectures and seminars in the University of British Columbia and has written articles for various journals. He is currently acting as historical advisor on a film project titled ’Cyrus the Great’, and will be appearing in a History Channel documentary on the Persian Empire in October 2006. Professor Richard Nelson Frye is an American scholar of Iranian and Central Asian Studies, and Aga Khan Professor Emeritus of Iranian Studies at Harvard University. He has researched the history and culture of Iran for over six decades. He founded the Center for Middle Eastern Studies at Harvard, the first Iranian studies program in America, and has written many books including The Golden Age of Persia (1977) and The Heritage of Central Asia (1996).